Curious about how your brand stacks up against competitors in your industry? Or maybe you’re wondering if your engagement rate on Instagram is actually good. You can easily answer these questions and more by doing a social media competitive analysis. A lot of brands measure success based on their own growth. Your followers increased 20%, great! You’re averaging 10% more comments per post, awesome! Or is it? While all those numbers are great, how do they stack up against similar brands in your industry? Doing some competitor analysis allows you to benchmark your metrics against others to see how you stack up. You shouldn’t get too caught up in comparing yourself to others, but a social media competitive analysis can give you valuable insights into what works in your industry, some areas you need to improve and much more. The question is, how do you start? Don’t want to start from scratch? We’ve got you covered. Download our free social media competitive analysis template. First, identify your social media competition and find which platforms they use. Hopefully, you already have a general idea of your main competitors. But there’s more to it than that. You want to focus on the competitors that actively use social media marketing to grow their business. Believe it or not, even in 2018, there are a select few brands that succeed even without a major social media presence. For instance, Huy Fong Foods is the company behind the popular Sriracha sauce with the rooster logo. While they do have Twitter, Instagram and Pinterest accounts, the CEO David Tran has made it clear they don’t invest a ton into marketing. So while they could be an industry competitor, hot sauce brands are probably better off looking at other food brands that are more invested in social when conducting a social media competitor analysis. You can rule out large online marketplaces like Amazon, Best Buy, etc. Look for websites that are in your specific industry. In our example, Hodinkee and Crown & Buckle could be good options. The second step is to go to each website and identify whether or not they’re active on social media, and which platforms they use. Most websites link to their social media profiles in the header or footer of their site. Also look through the social networks you’re interested in pursuing. MVMT is a popular watch company that’s very active on social media, so it makes sense to add them to our analysis as well. Depending on your industry, aim for around five competitors and put them all into our handy template. This is where you’ll store all of your data. Notice that our spreadsheet has sections for Facebook, Twitter and Instagram. For your analysis, you can choose any social networks you’d prefer. You’ll likely notice most brands in your industry have three or four main platforms in common. This process can take a lot of time if you’re in a highly competitive industry. But the more thorough you are, the better results you’ll get. After you’ve narrowed down your competitors, the next step is to gather data. The process will be slightly different depending on which platforms you target. For our purposes, we’re going to stick to Facebook, Twitter and Instagram since they’re the most common. You can use Simply Measured’s advance competitive reports if you want even more data. 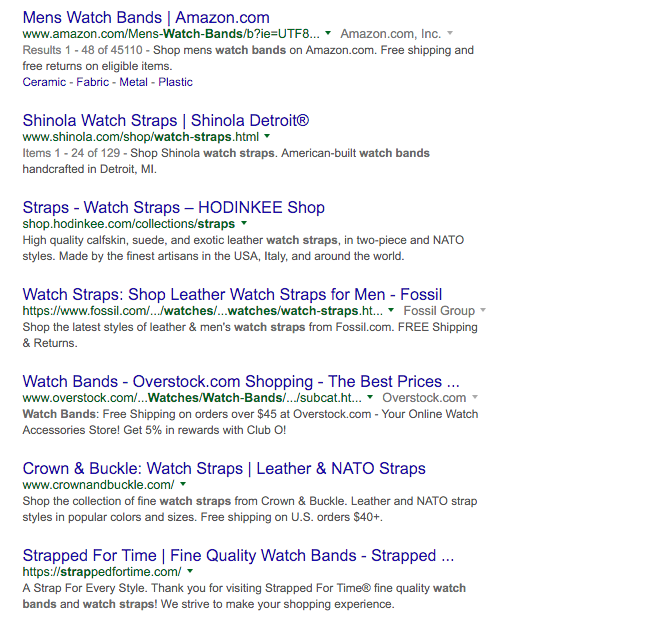 Start by doing a manual review of your competitor’s page. You’ll be able to see basics like the number people that follow or like their page. It’s also a good idea to jot down any specific tabs or features they have. In this instance, it looks like they have the shop section enabled and they’re highlighting at the top of their page. If we notice the same trend with other competitors, it’s likely a good sign it’s working for them. Follower count is nice to know, but that’s not where your competitive analysis should stop. 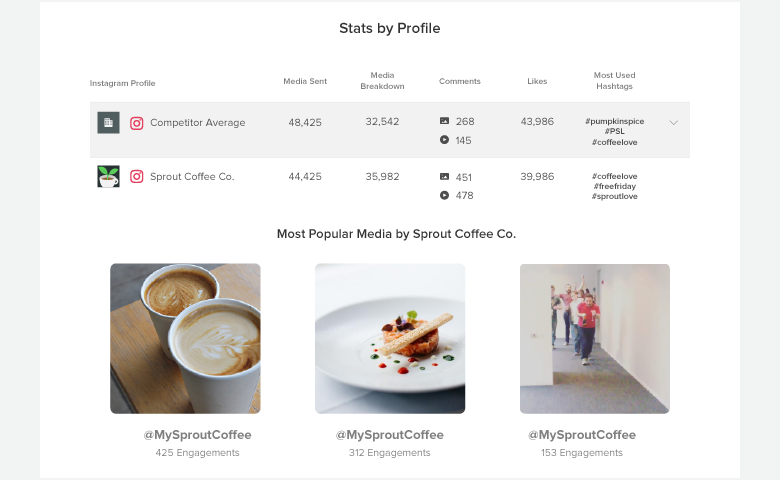 Use Sprout’s Facebook Competitor Report to get additional data on how well the competition’s content performs. You can see how many messages your competitors send and receive, the types of content they’re posting (text, images or videos), engagement and much more. Include all of this in your spreadsheet, as well as any additional metrics that are important to your brand. Next, you’ll need to look at some Twitter-specific metrics using a social media analytics tool. Sprout’s Twitter Comparison Report is the perfect tool for the job. It compares your Twitter profiles against each other, or a competitor. Select your Twitter account, then enter a competitor for the other slot. 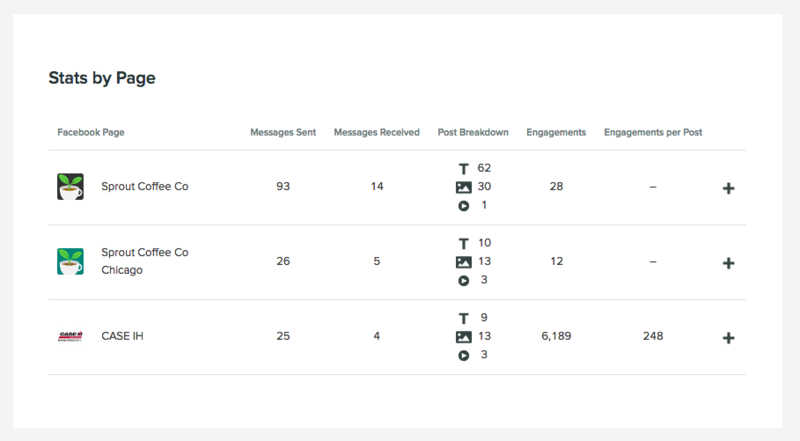 The report shows you engagement, influence, followers gained/lost and mentions. You can change the time period, but it’s best to stick to the last 30 days to keep the data relevant. Once you’ve looked over all the competitive social media analysis from the Twitter report, be sure to enter the data into your spreadsheet. Tracking this information can be extremely valuable down the line. Audience growth: Are your competitors growing their audience quicker than you? Media sent: Get a sense of how frequently your competitors are publishing. You may find you’re not posting enough to keep your audience engaged. Engagement: See how many likes and comments your competitors are getting on their content. Hashtags: Find your competitors’ most frequently used hashtags. You may be able to use the same ones in your posts if they’re relevant, and get exposure to more people. 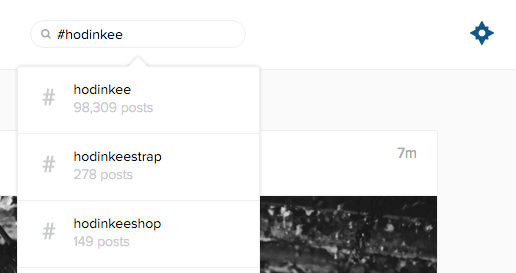 Top posts: Take a look at your competitor’s most popular posts. Try to get an idea of why these posts are performing well. Are they product photos? Do they use certain colors? Find out what these posts have that your content doesn’t and use the info to improve your images and videos. Another interesting tactic is to do a search for #brandname on Instagram and see how many results come up. This gives you a good idea of your competitor’s popularity. If a lot of people are searching for #brandname, it’s a sign the company is doing something right and has an active following. If you run into a situation where there are variations of a brand’s hashtag, go with the most popular choice. This will usually just be the company’s name. For instance, Hodinkee has a few hashtags. But you’ll notice most posts use #Hodinkee alongside alternatives like #Hodinkeestrap. In this scenario, it makes more sense to just use #Hodinkee. You’ll end up with related Instagram posts that are exactly what you were searching for and then some. Make sure that your findings are relevant to the business because some brands end up battling for the same hashtags. Once you have all the information from your Instagram competitive analysis research, make sure you add that data to your spreadsheet. You’ve gathered the numbers, but you also need to look at how your competitors use each platform. This requires a manual review. Are there long spans of time between each post? It’s fairly easy to gauge how active brands are by answering these three questions. They should post at least once every couple of days to be considered active. Next, look at the type of content your competitors publish. Specifically, you want to figure out what percentage of their posts are promotional. Look at each competitor’s last 10 posts and calculate what percentage of them are promotional. Promotional posts include links to a product, a sale or a contest. For retail brands, it’s a little tricky to decipher between promotional and non-promotional posts. A good rule of thumb is if the posts has a call to action to make a purchase, it’s promotional. For instance, this isn’t necessarily a promotional post, even though it features a product. But the post below has a specific call to action, asking people to shop. So it would fall into the promotional category. Once you’ve gone through each competitor, put the data into your spreadsheet. Some marketers like to look at their competitor’s voice when doing a social media analysis. Voice describes the tone and POV a brand uses on social media. Do they post on behalf of the brand (we) or do they allow individuals to post (John). Include this information if you’d like, but your specific tone will largely depend on your preference. It shouldn’t be too swayed by what your competitors do. The last part of your social media competitive analysis involves their website. As you know, content marketing and social media are closely related. As a result, a lot of companies use blogs to create content to be distributed on social media. Take a look at your competition and see how many of them have blogs. Looking through their blogs will give you ideas of the type of content that might resonate with your audience. If you’d like, go the extra step of plugging each site into Buzzsumo to find the posts with the most social shares. This step is optional for most industries. However, if you’re in an industry where blogging is extremely popular (fashion, SaaS or fitness), then you’ll probably want to follow this step. Now that you’ve compiled all of this data, you need to put it to use. Using your brand’s own social media analytics, you’ll be able to compare your profiles to the competition. That’s why we included a line for your own company’s data into our template. It’s important to keep in mind that this social media competitive analysis isn’t for you to copy exactly what everyone is doing. Instead, it will guide you toward getting started on the right foot. For example, maybe your analysis shows most of the competition only publishes promotional posts 10% of the time. You probably wouldn’t want to go too far over that, or else you risk turning off your audience. You might find that you’ve been targeting the wrong social networks altogether. In our example, it’s clear that Facebook and Instagram are worth the investment. Any competitors not using these two would be losing out. In the end, it’s all about comparing your brand’s metrics and data to the competition. Make any necessary adjustments to your strategy based on what you find. If you’ve never done a social media competitor analysis, give it a try. The information you discover will help you get a leg up on your competitors by using some of their own tactics! Have you ever completed a social media competitive analysis? Leave a comment and let us know what you include!